• The ACA is open for business. It has not changed. • There are still good deals on insurance to be found. • You must re-enroll if you are already on in order to stay covered. • The premium increases for Arizona are small. Please post this information on your Facebook page; send it around via Twitter; take it to wherever you volunteer, like at Food Banks or at the Farmers Market; post it at your church; share it with any younger working people that you encounter, starting now. The White House strategy is to sabotage the marketplaces by making this process short and confusing and decreasing the numbers of people who can help people enroll. We can try to push back and spread the word. THE ACA IS ALIVE AND WELL AND OFFERING INSURANCE UNTIL DECEMBER 15TH. I Believe I Can Make A Difference! · They make public statements regarding each of these issues. Note: Ask her specifically what happened to the “Problem Solvers Caucus” work on stabilizing the ACA marketplaces. Get email addresses, snail mail addresses, fax numbers, Facebook page links and Twitter feeds on their websites. To do Resistbot: Put Resistbot,io in your browser and follow the directions for texting that turns into faxes. Or text "resist" to 50409. I Believe I Can Make a Difference!! I Believe I Can Make Difference! This documentary explores the “intersection of race, justice and mass incarceration in the United States.” It is titled after the Thirteenth Amendment to the U.S. Constitution, which freed the slaves and prohibited slavery (unless as punishment for a crime). Director Ava DuVernay demonstrates that slavery has been perpetuated since the end of the Civil War, through arrests of poor freedmen, convict leasing, disenfranchisement, lynchings, and Jim Crow. She addresses the “war on drugs” that weighs heavily on minority communities, and the mass incarceration of people of color in the U.S., along with the prison-industrial complex. A brief Question/Answer period will follow the film. 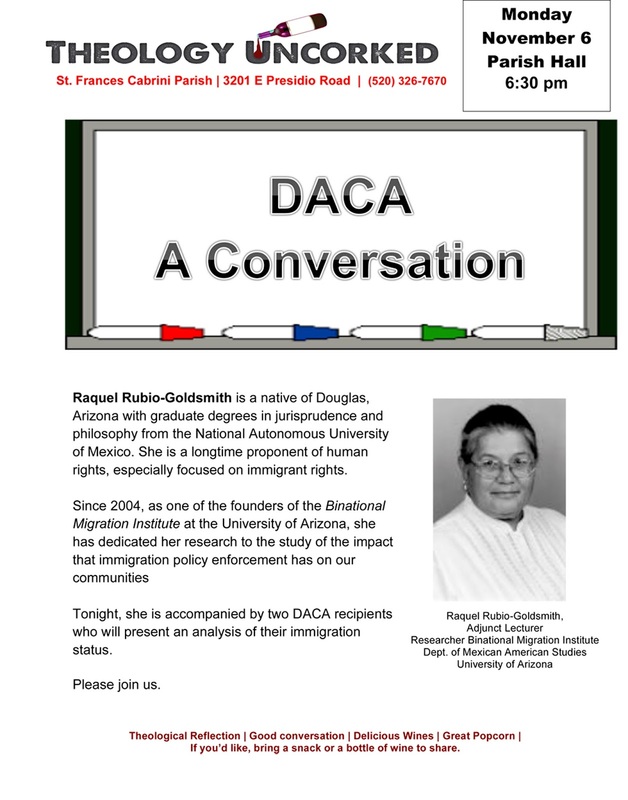 This event is offered by Action4RacialJustice, a working group of alliance4action. alliance4action is gearing up for a busy season as we welcome back our winter visitors. We’re keen to hear about the activities being taken in your home town. We have taken some organizational steps we’d like to share with you. alliance4action empowers and mobilizes our community to elect candidates and supports solutions that promote democracy and reflect our progressive values. Those with a # next to their name comprise the Core Group and do advance planning for the Leadership team. We have fixed meeting dates and times. The Leadership team meets the second Friday morning of the month and the General Membership meets the third Friday. The Core Group meets on an as needed basis. 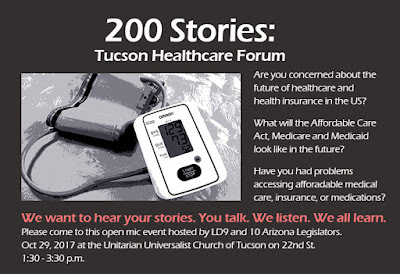 Specific information on the dates and guest speakers for these meetings can be found on our Facebook page and our website: alliance4action.org. Most of our action teams have been meeting on a regular basis over the summer and their accomplishments have been many. Those include Health Care, Education, Racial Justice and Electing Progressive Candidates. The Immigration and Climate Change action teams are now resuming. Our LGBTQ group needs a new leader. Information about meeting times is available at aliance4action.org. 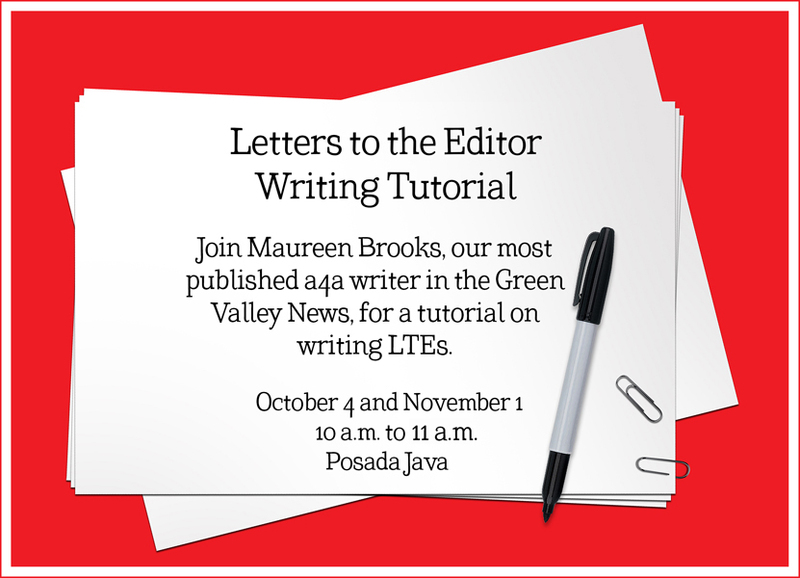 Next steps are to write by-laws and fill some critical positions. We’ll be publicizing the organization at Farmers Markets starting November 1. We hope you will join us as we REENERGIZE! 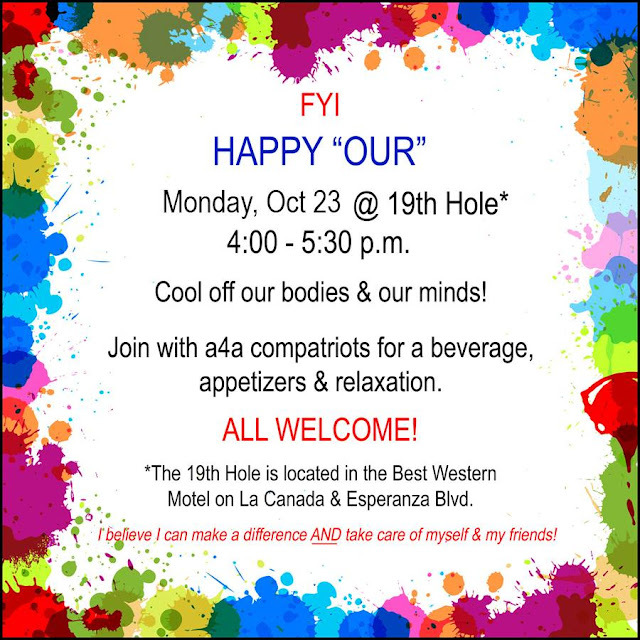 Put our Happy Our on your calendars for Monday, October 23 at 4 pm at the 19th Hole and spend some social time with like minded people!! The STAT team from the Stand Together Arizona Advocacy and Training Center with YWCA Southern Arizona will present Operation Haboob & you are invited to attend! Their goals are written below. You're invited to take Arizona by storm! 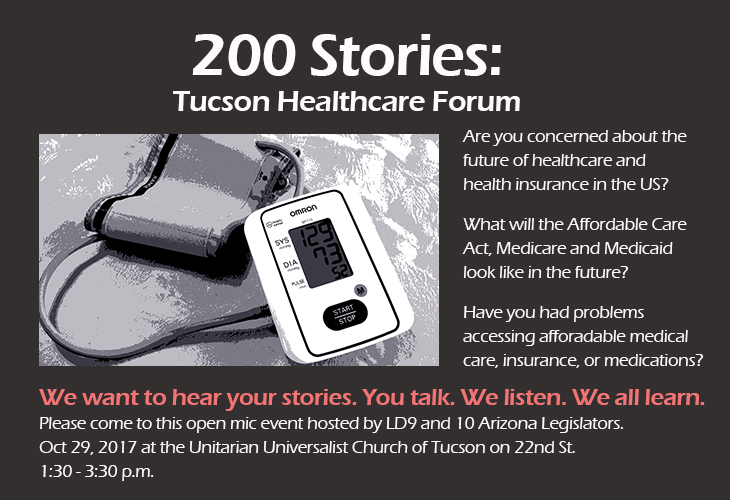 We know that you are as concerned about the current state of Arizona and its future as we are. That’s why we are asking you to help us launch Operation Haboob this month. It is time for us to take Arizona by storm – to reclaim democracy – to give power back to the people of Arizona to take it away from powerful, outside interests – and to make this state a place where everybody can thrive. • Operation Haboob is intersectional. The issues that we all care about are related. 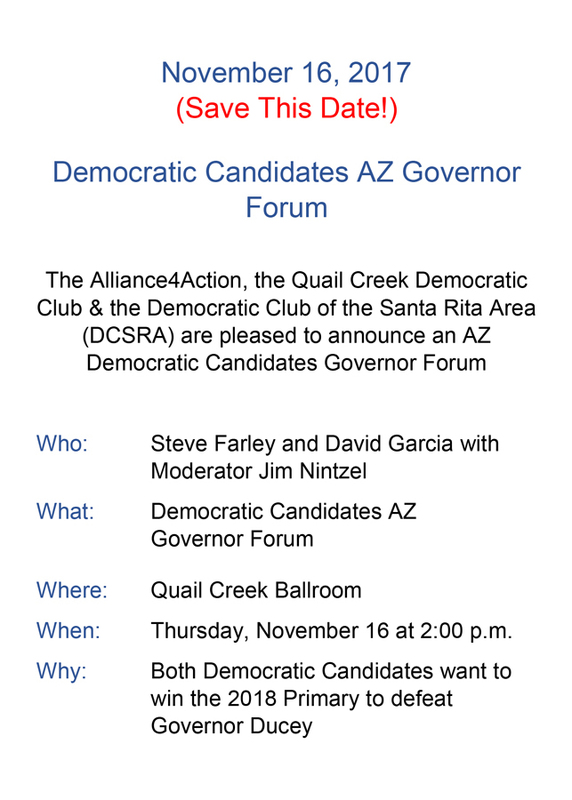 Let’s start working together to develop and drive a unified agenda for Arizona. • Operation Haboob is about movement building. This is a long-term project to put power back in the hands of people -- and we’ve launched the Stand Together Arizona Training & Advocacy Center (STAT) to give this project a backbone and the support it needs to succeed -- but it is not about starting a new organization. It is about all of our organizations and groups working together. • Operation Haboob is non-partisan. This effort is “political.” We want to put leaders and laws in place that will make Arizona a place where everyone can thrive. But we are not supporting a particular Party. We want all of our leaders to be accountable to the people. We believe that we have an opportunity to make real and meaningful change in this state. But we can’t do it without you. The challenge is clear. The time is now. Let’s take Arizona by storm and make it a place where everybody can thrive. Let’s do this. Together. 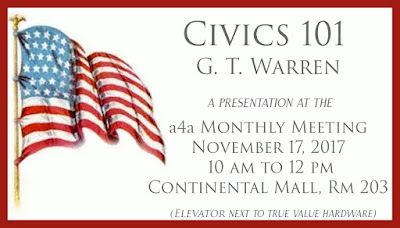 and will be our guest speaker on Saturday, October 21st at 3:00 pm. 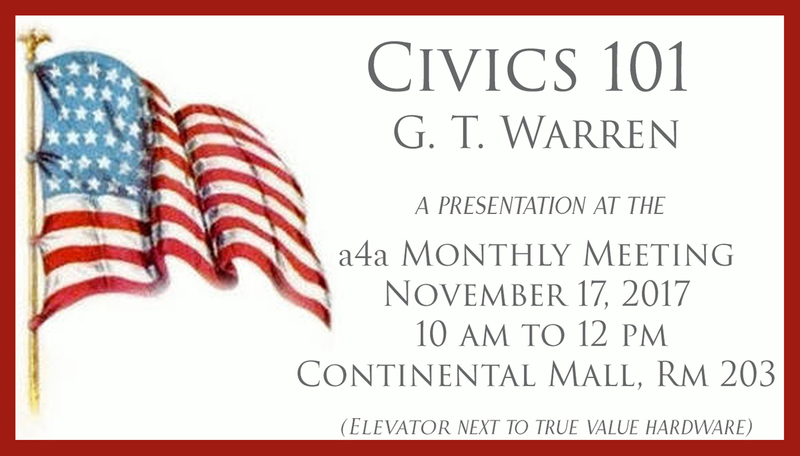 The program will be held in our upstairs conference room, #203 in the Continental Shopping Mall. Mr. Schapira is an informed and passionate speaker and this is a "must see" presentation for all who are concerned about public education in Arizona. Following the question and answer period of the program there will be a wine and cheese reception. This program is a partnership between our DCSRA Programs Committee and the Alliance4Action Election of Progressive Candidates Committee. We look forward to seeing you there. The Cost-Sharing Reduction payments (CSRs) go directly to insurance companies working in the ACA individual marketplaces. They are key to keeping co-pays and deductibles affordable for some 7 million lower income Americans. They are key to stabilizing the ACA marketplaces, now and going forward. The President announced the immediate cessation of these payments. His goal is sabotage, pure and simple. The First Action we can take is to call the White House Comment Line to register our disapproval. See below. The Second Action we can take is to call, Resistbot, email, Facebook, Tweet or fax our Members of Congress to protect the CSRs legislatively. Senators Flake and McCain must actively support the Murray-Alexander bipartisan effort to stabilize the marketplaces, including CSR preservation. Rep. McSally must jumpstart her bipartisan “Problem Solvers” Caucus in the House to do the same thing. See below. Get fax numbers, email addresses, Facebook and Twitter connections on-line at the websites for Flake, McCain and McSally. Calls and Resistbots are recommended. New to Resistbot? Text “resist” to 50409 or put resistbot.io in your browser. • Raise premiums for middle class families. • Increase the federal deficit substantially over 10 years. • Drive a million people out of the marketplaces. The STAT team from the Stand Together Arizona Advocacy and Training Center with YWCA Southern Arizona will present Operation Haboob at the Alliance4Action general meeting on Friday, Oct. 20 at 10 a.m.
Operation Haboob is a recently launched statewide project that includes an online survey to help us create a people-powered platform to help voters and lawmakers understand what really matters to Arizonans this next election season. 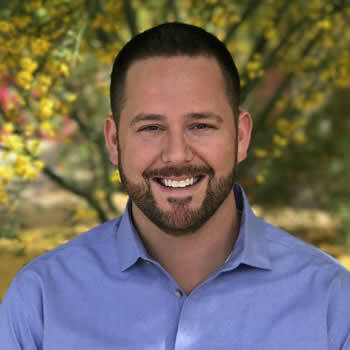 Our goals the next few months are to rebuild community, revive democracy and create a storm of thousands of Arizonans across the state eager to vote and be engaged. We can help the Dreamers now! 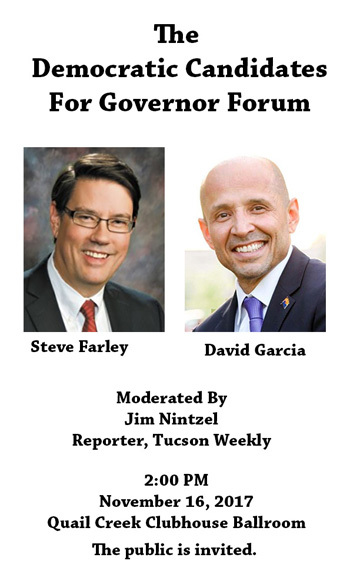 Meet Wednesday, October 11 from 3 to 5 pm at Cayley Cakes, 555 N. La Cañada, Green Valley. Bring a friend or neighbor. We will be getting you up to speed on the latest immigration issues. 1. Please contact your Republican senators and representatives. 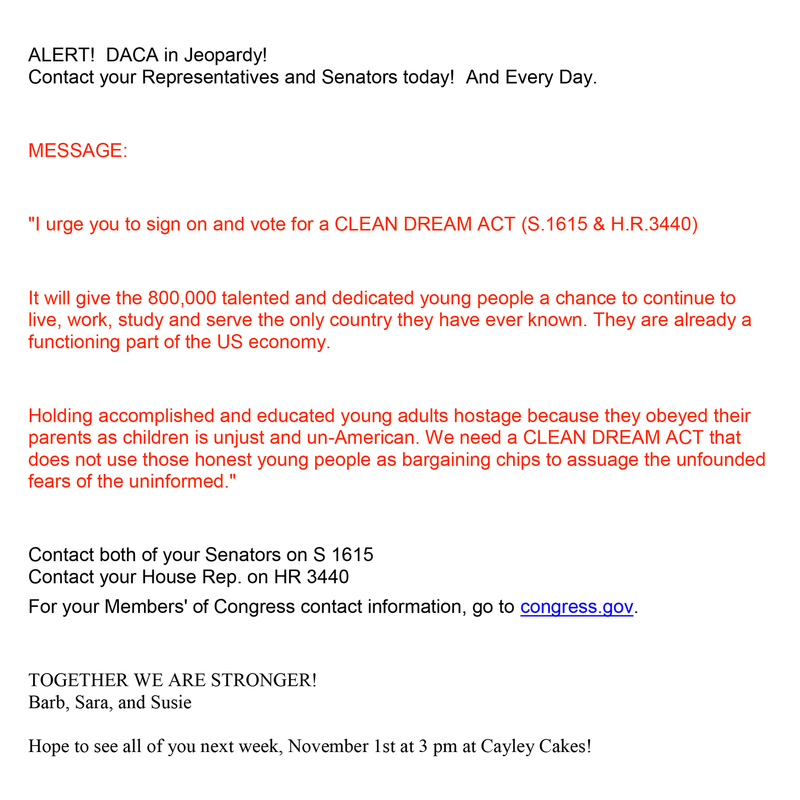 Call, write, fax, or email…or better yet, go in person…to encourage your Republican senators and representatives to co-sponsor and/or support the clean Dream Act bills in the Senate or House. A clean Dream Act is one without adding on a border security piece, which was discussed by Schumer, Pelosi and Trump. To contact legislators in your state, go to congress.gov, click on “Committees” at the top, choose the pertinent Committee in the Senate or House, choose Membership and it will take you to a link with contact information for your senator or representative. S1615 Dream Act of 2017 is in the Senate Judiciary Committee. AZ Sen. Flake is a co-sponsor and on the Judiciary Committee. There are presently only 3 Republicans out of 9 co-sponsors. Let’s get more! HR3440 Dream Act of 2017 is in House Judiciary Committee - and the Committee on Education and Workforce. There are presently only 5 Republicans of 200 co-sponsors. Let’s get more! 2. Donate to the Dreamers. Dreamers have until October 5 to renew their applications. You can help by donating toward the $495 application fee for a Dreamer’s renewal. Here are two viable ways to do it. Want to get your letters to the editor published?